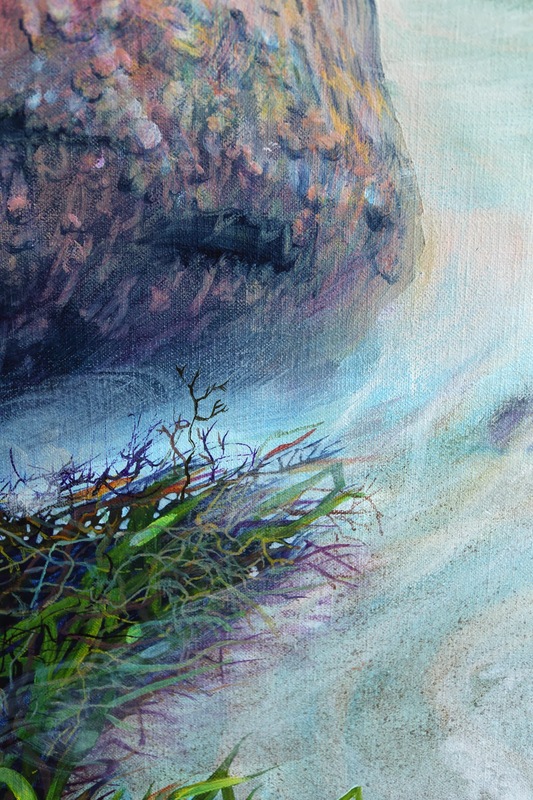 Detail of the painting "After the storm"
This painting is the result of a long period of contemplating "What next". I had the idea of getting more action and depth into my work by perhaps lowering my point of view even further than I had been. Also I wanted to depict movement, in this case of rushing water. The title of the painting "After the storm" literally means what it says, as I started the work on it inspired by the latest gale force winds and high seas. Well the seas don't actually get that high here but there was a lot of foam and spray in the air which prevented me from painting outside. I wrapped my camera in a clear plastic bag and took lots of shots on the beach in all directions. The camera was kept steady on a Gorilla tripod just a few inches from the wet sand. The final reference picture is the result of several images I pieced together. The eye can then wander through the seascape right from the close-up details of the seaweed in the foreground and all the way out to the far off horizon.